when she moved from Quebec to British Columbia. Along with her household belongings, viagra she brought 11,500 pounds of maple syrup. Her plan was to sell the syrup at Expo but, once Expo ended, she found herself with remaining inventory. She started making and marketing gift baskets so she could unload the rest of the syrup. This home-based enterprise was a huge success. Always on the lookout for the next trend, she then mastered the art of hand-painted leather jewellery-making and developed a product line that was distributed in boutique stores across Canada. Spink’s enthusiastic entrepreneurial spirit and achievements did not go unnoticed. In 1997, she was hired by the Business Development Bank Canada to teach people in the Comox Valley how to be self-employed and write business plans. Always eager to take on a new challenge, she moved up Island from Coombs. Dyan teamed up with Gary Spink soon after moving here. The couple clicked—partly because the entrepreneurial spirit bug had bitten him, too! Gary had been successfully self-employed for many years as well. After selling his Parksville/Qualicum-based business, he had moved to the Comox Valley to help Tory & Sons Plumbing and Heating grow what was then a new business. While Gary worked full-time at Tory & Sons, Dyan was kept busy with the teaching contract during the fall and winter months. She loved what she was doing but needed to generate some income during the summer. Not one to sit back and simply smell the coffee, she decided to build a business based on her favorite beverage. Dyan had previous restaurant industry experience and was a barista, so she bought a mobile coffee cart and christened it ‘Joe Cartos.’ She began selling Joe Cartos specialty coffees at the Comox Valley Farmers’ Market. The locals quickly learned to love their signature mochas topped with chocolate whipped cream, Chai lattes, espressos and other decadent specialty coffee beverages. A few months later, the Spinks launched Joe Cartos Coffee Cart Manufacturing. Gary’s technical background and Dyan’s business experience proved to be a winning combination. They introduced Joe Cartos to entrepreneurs across Canada by selling their Food Safe-certified mobile kitchens at industry trade shows. “We didn’t just sell coffee carts,” explains Dyan, “we made it a complete turnkey operation. 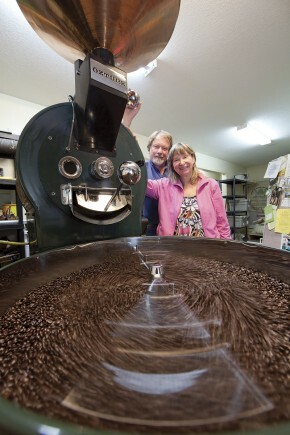 I taught people how to operate their new enterprise, giving instruction and support on everything from how to make coffee to keeping financial records.” In 2002, the Spinks were recognized for their efforts with the Vancouver Island Business Excellence Award (BE) for Small Business of the Year. While attending trade shows to sell Joe Cartos to others, the Spinks became sold on the idea of artisan custom coffee roasting and began researching this as another possible business venture. In 2004, their coffee cart business moved in a somewhat unexpected direction. In preparation for Westjet’s then new airline service to the Comox Valley, Dyan responded to a Request for Proposal to operate a new restaurant at the airport. (She was, after all, an expert at writing business plans.) The challenge was to build a menu based on a food service operation that could not have a grill. Of more than 30 submissions, Spink’s innovative plan for ‘Joe Cartos On the Fly’ was selected. A modified Joe Cartos Coffee Cart formed the basis for the food service operation—who knew you could make scrambled eggs using an espresso machine! The Spinks operated Joe Cartos On the Fly from 2005 through 2007. In addition to building a successful food service operation that focused on local and organic food, they also won more awards. Joe Cartos On the Fly was voted by airport patrons as #1 in Food Service for airports under 500,000 passengers by the Airport Council of Canada. In 2005, they earned another BE Award for Small Business of the Year and were the runner-up for Restaurant of the Year. While Joe Cartos On the Fly was deemed a success, the Spink’s interest in building a coffee roasting business continued to brew. During its first season of operation, the two-bedroom vacation suite, called A Great Place to Stay, attracted visitors from all over the world. Guests enjoyed all the comforts of home, a view of the ocean and, of course, fresh Royston Roasting coffee. My attention is now drawn to the large steel and hand-tooled copper coffee roaster positioned just a few feet away from Dyan’s office area. To me, the assortment of knobs, dials and gizmos on the front of the machine resemble a big smiley face and remind me of the cartoon characters Thomas the Train or The Little Engine that Could. I can imagine how ‘perky’ it looks when its ‘mouth’ spews toasty brown coffee beans into the big cooling dish positioned below. It is capable of roasting about 15 kilos (33 pounds) of coffee in about 20 minutes. The roasting process combines state-of-the-art high tech instruments with old-fashioned hands-on techniques. Green coffee beans poured into a hopper on the top are then dropped into a rotating drum where the temperature easily reaches 200 degrees Celsius. The roastmaster controls the roast by paying close attention to timing, temperature, smell and color. In this business, mere seconds can make the difference between the perfect espresso or over-roasted. Dyan then guides me over to an assortment of 40-to-75-kilogram burlap sacks that contain fair trade organic raw green coffee beans. Then, she starts opening bulks bins that contain the soon to be packed finished product. Royston Roasting has four signature roasts—Swiss Water Processed DeCaf, Dark French, Medium Colombian and Espresso. For their Christmas Blend, they package a special mix of espresso and medium roast. They also make a ‘half-caf’, a 50/50 mix of medium and decaffeinated beans. She takes a scoop of each variety and points out the special attributes of each one. Color, size and aroma are part of the analysis. I inhale deeply—they all smell exquisite! Coffee doesn’t grow like a typical bean. It grows on trees and, prior to being handpicked, the ‘fruit’ looks like cherries with the coffee ‘bean’ as the ‘pit.’ Coffee is grown in several equatorial countries and is typically harvested from January through March. The beans used at Royston Roasting Company are purchased from several countries, including Colombia, Mexico, Peru, Panama and Nicaragua. In an effort to truly give farmers fair prices for their coffee beans, considerable effort is being put into a system to buy Direct Trade. No broker. No Government. As a member of collective buying group called the Roasters’ Guild of North America, Royston Roasting is now working toward buying all their coffee direct from the individual farmers or through the Collective, paying them in advance to secure the harvest. The Spinks have been personally visiting farms where their coffee comes from and this spring Gary will be working and participating with one of the harvests. Now that’s a nice perk of owning a coffee roasting company! While Dyan Spink takes pride in her abilities to roast fabulous coffee, it is her efforts in packaging and marketing her product that are setting a new standard of excellence. Interest in Royston Roasting coffee has spread by word-of-mouth. In addition to wholesaling coffee to non-profit groups, custom packaging for business promotions, and selling at the Farmers’ Market, Royston Roasting Coffee is sold in a select group of local specialty or convenience stores. See their website for a list of locations. Again, Dyan Spink’s efforts have not gone unnoticed. Last spring, she applied for and was invited to a preliminary screening for a potential appearance on the hit TV show Dragon’s Den. She didn’t make the final cut but had a blast meeting the crew! She has also had to make more room on her awards shelf, adding the Business Excellence Award for 2011 Manufacturer of the Year. If past success is any indication of the future, there is a good chance that Royston Roasting Company will soon be up for another award. “I am excited to announce that this December, we will officially open the Royston Roasting Coffee House,” Dyan says. The Spinks are excited about this latest venture. The new location will enable them to employ several local people, continue to promote Vancouver Island products and tourism, and educate others about something they are obviously very passionate about—a great cup of coffee. when she moved from Quebec to British Columbia. Along with her household belongings, she brought 11,500 pounds of maple syrup. Her plan was to sell the syrup at Expo but, once Expo ended, she found herself with remaining inventory. She started making and marketing gift baskets so she could unload the rest of the syrup. This home-based enterprise was a huge success. Always on the lookout for the next trend, she then mastered the art of hand-painted leather jewellery-making and developed a product line that was distributed in boutique stores across Canada. Dyan Spink’s entrepreneurial journey started in 1986, when she moved from Quebec to British Columbia. Along with her household belongings, she brought 11,500 pounds of maple syrup. Her plan was to sell the syrup at Expo but, once Expo ended, she found herself with remaining inventory. She started making and marketing gift baskets so she could unload the rest of the syrup. This home-based enterprise was a huge success. Always on the lookout for the next trend, she then mastered the art of hand-painted leather jewellery-making and developed a product line that was distributed in boutique stores across Canada. 000 grant-making foundations in Canada, according to the non-profit agency Imagine Canada, which offers an online database of these organizations. That number, and the database, are impressive, but also can be intimidating to a grassroots initiative needing funds for a local cause, or to a potential donor who wants to be sure their money is well-spent and kept within their own community. 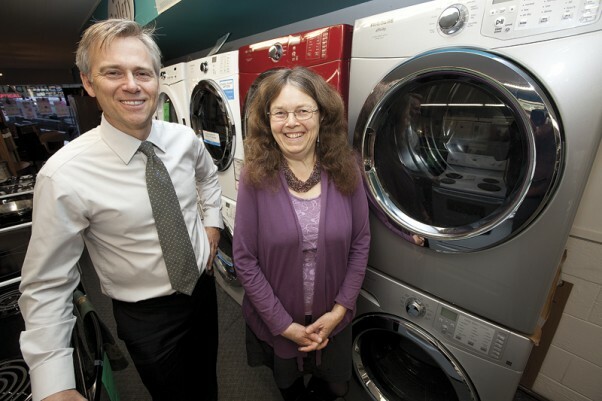 Lorne Harder, Comox Valley Community Foundation president, and Anne Davis from the Comox Valley Transition Society, which this year received $5,000 from the CVCF to renovate the laundry room at Lilli House, their home for women and children who are escaping abusive relationships. Luckily for the people of the Comox Valley, one name on the database is the Comox Valley Community Foundation (CVCF). The CVCF is run by locals for locals, giving both donors and recipients a personal, direct connection to the charitable process. Since it was founded in 1996, the CVCF has given more than $1 million to well over 100 local charitable projects, and to educational institutions through student bursaries. In 2011, it gave away $32,000 to eight projects. The range of the recipients reflects the Comox Valley’s diversity, and the CVCF’s five focus areas: arts and culture, environment, seniors, health and welfare, and education and youth. The CVCF has supported environmental groups, sports teams, theatres, museums, arts groups, search and rescue, salmon hatcheries, and community forests; it has helped build docks, therapeutic gardens, therapeutic riding facilities, playgrounds, fitness centres, trails, resource centres and a skate park. It addresses issues from homelessness to hunger, to domestic violence, and more. “It’s nice to be able to support such a tremendous number and diversity of groups,” says Lorne Harder, CVCF president. Harder, an insurance broker, was invited to join the board when his sister, who’d been involved since the Foundation’s inception, stepped off. He says he didn’t hesitate to say yes. “I like to be involved in community and this is my charity of choice. It’s local and very efficient,” says Harder. This diversity is one of the hallmarks of a community foundation—a special type of grant-making organization that collects and distributes funds within a defined region. The CVCF is one of 46 community foundations in British Columbia; there are more than 170 in Canada, which together hold more than $2.4 billion in shared assets. Other than the limited geographical focus, the other defining characteristic of community foundations is their total reliance on an endowment fund. This means that all donations are pooled in a fund that is never spent, but instead invested. The annual earnings are distributed as grants, while the principal stays untouched, and grows continuously as more donations come in. “The nice thing about this is that people making donations know it is a forever gift—there will always be a community foundation, and their money will always be doing good in the Comox Valley,” says Wendy Lewis, CVCF board member and treasurer. Lewis is a chartered accountant, and like Harder, she stepped up to fill a gap on the Board when her partner, Ben Vanderhorst, stepped down. When people give money to a community foundation, Lewis explains, they often have the whole community interest at heart and don’t want to direct their support toward one specific issue. Donors are welcome to target the funds they give to general issues, such as “animal welfare” or “children,” but not to get more specific than that, and most donations go into the general discretionary fund. “The way this works means you can touch a lot of good things with one donation,” says Lewis. The endowment fund ensures the CVCF’s longevity. As the economy waxes and wanes and markets rise and fall, the CVCF will have more or less money to disburse, but their ongoing existence is secured. Donors need to trust that the 17-member board to have an accurate and in-depth understanding of community needs and to respond accordingly, and to steward their money wisely. Because there is so much work involved, the CVCF board attracts people who are truly passionate about the Foundation’s work. For instance, long-term CVCF supporter Richard Graham has contributed both as a volunteer and a donor. Graham is a retired retail jeweler (from Graham’s Jewellers, now run by Graham’s son) who got involved when the CVCF was founded. “The Foundation was Stan Hagen’s idea and he enlisted people like Richard Swift, Murray Presley and Judith Harder. I was asked to join the board right at the beginning in 1995 and served for five years. I was the Fund Development Chairman for those five years,” Graham recalls. “The whole thing was a volunteer effort those first five years,” Graham adds. “We didn’t spend one cent on administration.” Currently, the Foundation hires one part-time staff person, but otherwise is scrupulous about keeping its administrative costs low. There are many different ways people can contribute to the CVCF, says Graham. “When I joined we had no money at all. My wife and I made a commitment to give $5,000 before I left the board. We managed that and have been giving ever since. We donate six to eight times a year, mostly through In Memoriam gifts for significant people in our lives who have passed away. It’s so easy to do—you just phone the office and give them your information. It takes just a few minutes. They send a letter to the families of the person who’s passed away, and this has the added benefit of spreading the word about the foundation,” says Graham. While the donors clearly get a great deal out of their relationship with the CVCF, obviously it is the recipient organizations, and the people they serve, who benefit the most. “We are very, very, very grateful to the Comox Valley Community Foundation,” says Anne Davis, Program Coordinator at the Comox Valley Transition Society, which this year received $5,000 to renovate the laundry room at Lilli House, their home for women and children who are escaping abusive relationships. “Try to imagine the state of our laundry room,” Davis says with a laugh, and explains: “We’ve been in operation for 18 years, which means somewhere between 4,000 and 5,000 women and children have come through. The laundry room had never been renovated before. It had been poorly laid out to begin with and was in horrible condition. Now it is beautiful, and efficient. “The CVCF has been great to work with,” she adds. “They are very community-minded and very concerned to be helpful in a practical way. The CVCF wants to hear from as wide a variety of charitable organizations as possible. They provide support to grant-seekers by offering an annual granting seminar, which takes potential applicants through the whole application process, making sure they understand what is required and what is and isn’t eligible for funding. CVCF grants range from $1,000 to $20,000 and can only be given to groups who are a registered charity. The Foundation does not cover regular operating expenses such as staffing, and will not cover 100 per cent of a project’s costs. Beyond that there are few limitations. In addition to the Transition Society, grant recipients for 2011 included L’Arche Comox Valley, the Cumberland Community Forest Society, the Tsolum River Restoration Society, Comox Valley Project Watershed, the Black Creek Community Association, the Cumberland & District Historical Society, and the Sid Williams Theatre Society Endowment Fund. In early January, grant recipients and Foundation donors will be guests at a special event called the Grant Tea. A total of 10 charities will receive funding for the coming year for a wide range of projects, ranging from equipment for therapeutic riding to archival storage containers for a museum. The level of competition for funding is variable year by year, says Lewis, depending both on the level of community need and the amount of funds available to give. “Some years we are flush and in others we don’t have enough to fund everyone we’d like to,” she says. When groups are awarded a grant, they are matched with a board member who helps steward the grant, and who reports back to the other board members. This is one of the best parts of being a board member, says Lewis. “The biggest reward of all this is seeing things happen. The Comox Valley is my community, and to be able to provide sustained support is a really, really big deal. There are lots of ways to support the CVCF, says Lewis. “You can just go to the website and hit the “Make a Donation” button. It’s that easy. Or you can make a bequest through your will so that a gift comes out of your estate. You can make a gift of cash, stocks, bonds, real estate, or other assets,” she says. While Lewis is of course eager to solicit more donations to CVCF’s endowment fund, she says the foundation is careful not to compete with other local non-profit groups for local funds. “Our mandate is to support other local charities, not compete with them. We are all contributing to the fabric of a vibrant, healthy Comox Valley. The CVCF doesn’t do our own projects. Instead we get to be really diverse and to give support in small doses, where it can make an immediate, practical difference,” she says. She and Harder are both deeply appreciative of the work done by the Comox Valley’s many charitable organizations. “The cool thing about the Comox Valley is that we have a large number of people who are involved in volunteer and charitable work, with an incredibly wide range—whether it’s mountain sports, homelessness, head injuries, children, or so many other issues… it’s so diverse,” says Lewis. “This is a community of giving.” The Comox Valley Community Foundation is clearly an integral part of that. The Alano Club of Courtenay is proud to be a recipient of monies from CVCF this year!!! We were overjoyed when we received our letter and stunned by the generosity of the support.